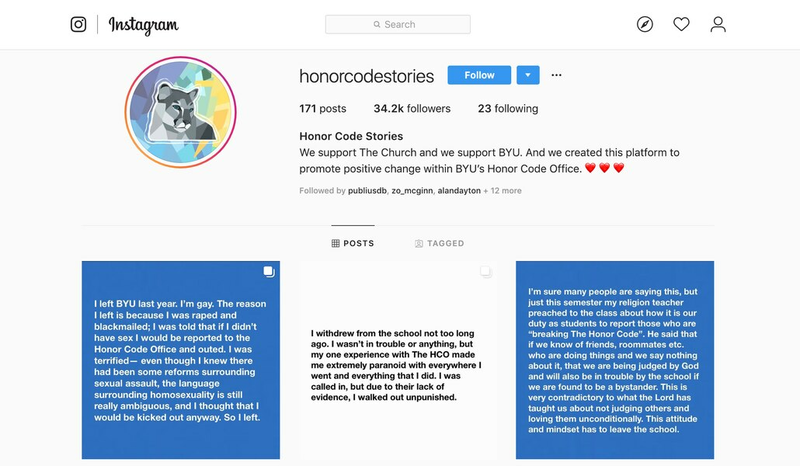 (Instagram) Sidney Draughon, a BYU alumna, created HonorCodeStories as a place to share anonymous stories about Honor Code investigations, pushing for change in the way the university investigates the actions of students. Hundreds of anonymous stories of accusation, intimidation and interrogation at Brigham Young University have been posted to an Instagram account boasting 34,000 followers and calling into question the private school’s enforcement of its honor code. The stories paint a combined portrait of current and former students living in fear and anxiety under the threat of expulsion and eviction due to alleged offenses ranging from extramarital sexual activity, to drug and alcohol use, to breaking curfew. On this week’s episode of “Trib Talk,” Sidney Draughon, a BYU alumna and creator of the HonorCodeStories Instagram account, and Tribune reporter Erin Alberty join Benjamin Wood to discuss calls for reform at the Provo school, and a perceived culture of peer-to-peer spying stemming from strict enforcement of moral and behavioral standards.